In our 20 years of knowing each other, we have shared a lot. I've laughed, I've cried, and yes, I've even posted petty references about you on social media. But today, I want to thank you for what I've learned from you. Mom, writer, social media rockstar, and content creator. I write to help amazing people continue to be amazing. This year we have known each other for 20 years. We can celebrate (or not), the fact that the same stop on the path of our careers created a special kind of forever for us. I'm not being sarcastic. I'm not going to say thank you for hurting me because I'm a stronger woman. I am going to say thank you because I learned a lot from you. 1. Thank you for showing me the back roads. I remember complaining that you did not like to drive on highways. I was used to rushing from place to place and felt that the side streets would not get me anywhere timely. You reminded me that, "Sometimes the highways are closed and you have to take a different route than you planned." That statement is especially true on the road of life. 2. Thank you for teaching me how to to investigate. You and I learned how to Google together. We used my journalistic curiosity and your police background to research anything and anyone. Since then, I've been able to teach our children how to question, how to fact-check, and how to pause before believing something that sounds too good to be true. 3. Thank you for being patriotic. There are people who have such a love for this country that all they are is about service to it. From your involvement with the military to your career in law enforcement, you love the United States of America. You believe in the inalienable rights, and you protect others based on those rights. Thank you for teaching our family that even though America is not perfect, it is ours. 4. Thank you for your love of music. During our time together, you would often come home from work and relax by listening to music on your headphones. That frustrated me because our house was always loud and messy and I couldn't get away. After we separated, I found myself cultivating my own music collection because I learned that I needed to escape myself. Music gives me that. 5. Thank you for living your calling. When I was 16, I knew I wanted to be a writer. After college, I followed a path that led to me doing a lot of different things other than writing. It took me until last summer to accept my calling. You knew you wanted to be a police officer when you were a boy. You now celebrate a career just shy of 25 years in law enforcement. Where the kids have seen my struggles with jobs I've had that weren't a part of my calling, they have seen your dedication to your calling in the police shield. 6. Thank you for trusting me. As we divorced, we never had an argument about the custody of our children. I can remember you saying, "It only makes sense for you take the kids, you know more about schools and homework and college preparation than I ever could." Many marriages end up in vicious court battles because of egos. I am convinced that ours was as good as it could have been because you trusted me. I don't take that trust for granted. 7. Thank you for sharing, not hiding, your love language. A friend introduced the concept of love languages to us. When I first read the book, I identified your love language, and decided that I hated it. While it sounds harsh, I am grateful for the opportunity to learn your love language first hand -- even if I didn't like what it revealed. As I'm sure you've figured out, this whole dating over thing 40 is tricky, and often clothed with a lot of deception. In the seven years we've been apart, one of the hardest things I've dealt with is trying to figure out the truth and what lies at the core of someone I am dating. 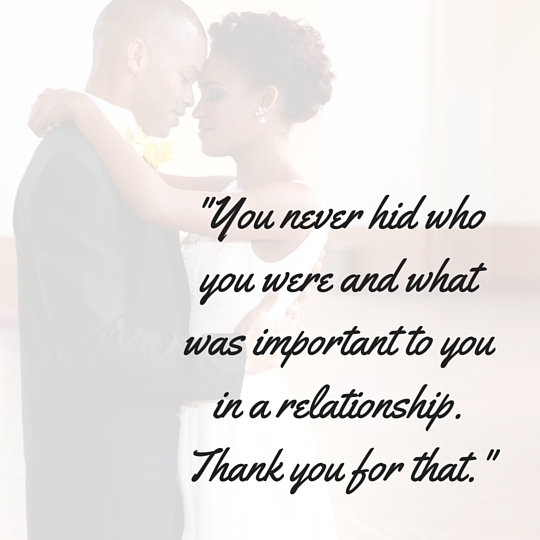 You never hid who you were and what was important to you in a relationship. While writing this letter, I came to realize that as we travel through life, we won't always be in love with experiences to learn and grow from them. We can acknowledge those experiences as a stop on life's journey because as you've said so eloquently before, sometimes you must take a different route that you planned.